The gathering shower turned into a ferocious thunder and lightning storm–over 500 lightning strikes last night in Philly! I slept through every moment of it. Astonishing. Today the storm is over the Atlantic, and blustery wind has moved in. Temperatures drop by the hour. Nonetheless, beautiful green leaves, colorful flowering trees and shrubs, and small wildflowers are taking over! No turning back the clock. During the last month I rearranged my daily routines to support what my heart wants and needs. Sometimes it’s as simple as postponing grocery shopping. Other times, it’s not so easy. Like staying home from church two of the last four Sundays after waking up with an unsteady heartbeat and the weakness that comes with it. On the other hand, during the same time frame I visited with two of my woman friends, talked with at least two others on the phone, had email correspondence with a few others, enjoyed tea and conversation with our next-door neighbors, walked regularly with D, talked with our son and daughter via phone, and played with Smudge. I’ve also posted from time to time, enjoyed hearing from some of you, and saw others peeking out from your gravatars! So here’s to a thoughtful Holy Week, listening to all nature sing on and off-key, and staying in touch with ourselves and with the Great Shepherd of the sheep. Much we need Thy tender care. Photo of Smudge playing hide and seek, taken by me! “Writing when Awake is dangerous.” I wrote this piece years ago, while Awake. When you get to the collage, click on it for a close-up. I agonized about whether to begin this blog. Not because I had nothing to say, but because I was terrified. Of what? I’m not sure. Probably the concreteness of truth. Even though I lived with it all my life, putting truth out there in concrete words is different. The words below are from my journal. I made the entry on 19 July 2012, about 18 months before I published my first post, Dear Dad. It’s a one-hour, non-stop writing exercise. What you see is nearly every word I wrote—reformatted. 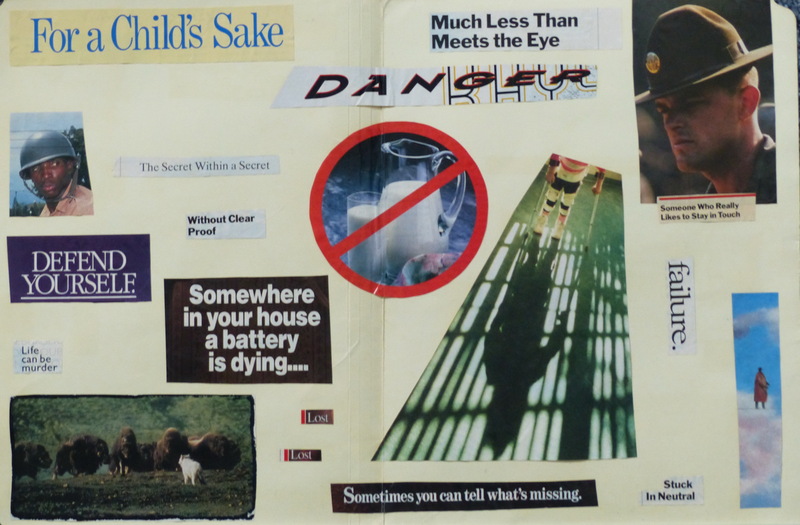 I made the collage in the early 1990s. I’m at my desk, keyboard in my lap, eyes closed most of the time—except to check the clock. The collage is on the wall just above my desk. Nothing but bits and pieces cut out of old magazines. It’s not a lovely work of art, but a crude icon. It reminds me of where I’ve been and how far I’ve come. Facing my fear and inhibitions. to do what wants to be done. Shout it from the rooftop. Hit the front pages of the newspaper. whether we/I like it or not. the cost of belonging to the human race. set-apart, holy or the preacher’s kid. between myself and people I may never know. and seemingly unending damage and pain. A bridge of respect for survivors. and prepared me for the life I now live. Am I looking for healing? When that means acceptance, yes. If it means pressing a restart button, no. can’t be undone so easily. This life was entrusted to me. Only I can live it. the sad and sorry truth about growing up female. This feels way out of control and out of reach. to put my head down and snooze. not quite halfway through this exercise. I need to sit a bit and collect my scattered self. This is a practice I need as I write. To belong to the human race takes audacious courage. Courage to do what doesn’t come naturally and is not always rewarded. Bottom line: Which price am I prepared to pay? There’s a price for me either way. and now I’m struggling to stay present. Feeling a tingly desire to go to sleep and not wake up! is worse than a nightmare. The clock seems slow today. I need to just sit. Drink Water. that wants to shut down just now. Eliminating what is poison or no longer of use to me. The collage comes to mind. I’m looking at it, getting teary. Somewhere in your house a battery is dying…. Sometimes you can tell what’s missing. The collage wakes me up! Brings tears to my mind [sic]. My reality—about which only I can bear witness. There’s no prettying up the truth. but in no way is this a pretty picture. Telling it will not be pretty. And it keeps telling me it wants to be told! Not hidden away like some shameful piece of my life. Some things can’t be omitted. To leave them out is to betray myself. In some ways this writing is a plea for understanding. but right on time in God’s economy. No, I haven’t disappeared from the universe. I’m just deep into packing for a trip to visit our daughter and her husband. Sherry took the photo above. The magnolia came from a tree in their yard. No, I am not one of those frequent travelers who always has a small, compact carry-on and a plan for minimal packing. There are reasons, of course, for my lack of this gift, but I won’t bore you with the details. So my new normal (assuming I have other opportunities for travel) kicked in the day after my birthday. So far, so good, even though it’s taking a lot of discipline to stay away from my computer and you! The upside is that I’m not yet freaking out, and might even make it to the front door with time to spare. I’m taking my laptop (of course! ), and won’t make any promises about posting while we’re away. However, photos might be fun to put up. So we’ll see what happens. Thanksgiving was bitter-sweet for us. We had dinner with our son, daughter-in-law, granddaughters and grandson. Plus their two big dogs and two small cats. They’re planning to move in the coming year. Not sure when, but it was our last Thanksgiving dinner in the old house they moved into shortly after the girls were born. Thank you for your many good wishes and notes about my birthday. We had a quiet day at home. Neither of us is what you’d call a party animal. Instead, we love quiet days at home, which this time included playing the piano and going for a walk. Plus reading pertinent and impertinent birthday cards. Actually, more than one of them gave me happy tears. Emily Dickinson’s short poem came to mind this morning. I first commented on it in March 2017, after the 2016 election and January 2017 inauguration of Mr. Trump as POTUS. Tomorrow we get to vote again, though not for another president. My comments follow in the form of a letter to Mr. Trump. I am not one of your fans. I am, however, a believer in more than chance happenings. First, a confession. For months, I’ve been captive to the anti-Trump approach to daily happenings. I didn’t think about you all the time. Nonetheless, following your election and inauguration, my days seemed governed by what you did and what I thought and felt about it. Usually it felt like going from one bad scene to an even worse scene. Looking back, I don’t regret thinking all that through, or writing about some of it. In fact, I rather enjoy going back to see my small trail of contributions to what’s been a national preoccupation and discussion. Trying to figure you out. There isn’t, of course, any figuring that will balance things out nicely. Especially for those whose lives are in disarray thanks to your words and deeds. Plus the words and deeds of others you’ve enabled, if not unleashed. And so I’ve moved on. I still believe each day contains the possibility of Victory, no matter how tomorrow’s midterm elections turn out. I also imagine Emily Dickinson’s “common ball” as our planet, which I would describe as this grand terrestrial ball. A dance, open to anyone who wants to accept the invitation. There’s only one hitch. Our Creator presides over this dance. Not any human leader, billionaire or organization. So I’m taking dance lessons again. My neighbors and their pets are teaching me to lighten up. Women and men of color are teaching me to listen deeply to what’s happening. Children of all colors are teaching me to forget about how I look and how old I am. Friends of many years are helping me reconsider my dance partners. I’m tired of the same old rhetoric, the same old hopes for tomorrow, the same old anxiety about whether I’ll be asked to the dance. I’m already in the dance! Stumbling along, sometimes gifted with a bit of insight, scraping together my courage, and showing up in the grand ballroom of life. You might like to try it yourself, if you dare. On 21 April 2016, I broke my jaw and my wings were clipped. Not just by the broken jaw, but by a string of unanticipated health events that followed. Today it takes time to attend to my aging body. So I often wonder what the meaning of my life is now. Why am I here? I know I’m going to die. So what about the meantime, in whatever time I have left on this earth? Is blogging it? I love blogging, but…. A couple of weeks ago I got an email from a friend and former colleague at the seminary. Would I be willing to interview a seminarian working on her MA degree? The answer was Yes! Of course! Big smiles and happiness! A high point in my life! So this last week I spent time on the phone with her. Lots of time. We didn’t talk about the fine points of my life as a pastor (which I am not). Instead, we talked about the not-so-fine points of my life as a survivor of childhood abuse. Especially what it took in my late 40s to begin the long process of healing while I was professor and then dean at the seminary. Why was this conversation a high point for me? Because it let me know I still have something to say. Especially, but not only to women and men preparing for ministry in churches, or for leadership in religious organizations. Blogging about my experience has been and still is part of my healing. Yet nothing beats a one-on-one conversation, or a small group discussion in which I’m able to talk about what it took for me to begin healing. We’re all dealt cards we didn’t ask for, even before the moment we’re born. Going into a professional position or a new job doesn’t magically make all that disappear. In fact, it often triggers it. Understanding how trauma shaped and still shapes us is worthy of our best efforts. Not alone, but together. I don’t know how this will play out. Nonetheless, I’m hoping for more informal opportunities in which my personal and professional experiences come together in surprising ways. I wrote these words on Friday evening, the day after last week’s Senate Judiciary Committee hearings of Dr. Christine Ford and Judge Kavanaugh. The poem attempts to capture in words the look, sound and feel of time running out. But for whom is it running out? I don’t think we’ll know that for a while, no matter how this plays out. I didn’t think this up by myself. I heard it in a public radio interview with a woman working on behalf of sexually assaulted persons. Her comment rang true, given my sense of despair and hopelessness. I need to keep the focus on my sanity and health. Take care of myself. The images and words I saw and heard during the Judiciary Committee hearings took me right back to the meeting with my parents in 1993. When I left that meeting I knew I couldn’t change my father’s attitude toward me, or my mother’s loyalty to him as her husband. Yet perhaps I might make a difference for other survivors, or even for a few perpetrators. I still think that’s possible. Most difficult is the high level of commitment I need just to take care of myself. Daily. Especially as I age. And then there are those unpredictable bombshells that keep hitting the news. So here I am, still committed to telling the truth about myself. Not simply as a survivor, but as a thriving adult woman given an opportunity to make a difference, beginning with herself.